Pointless babble or social grooming? There’s a kerfuffle on Twitter at the moment about a study of Twitter that found that “Twitter tweets are 40% [pointless] babble“. I know, I know, another new media self-referential navel-gazing situation. But it serves as a good example of a really important point about teaching with new technology. Teachers have to be immersed in digital technologies if they’re going to make good use of them in learning. But these fish-in-a-barrel shortcomings don’t really matter: in broad-brush terms, it’s probably roughly right that traffic on Twitter is about 10% self-promotion and spam, 10% of news broadly considered, 40% conversation, and 40% ‘pointless babble’. Now I’m certainly not arguing that research in to new technologies is not valuable to teachers: it’s hugely important. (And I would say that, it’s a large part of my job!) But without a practical perspective – and I suspect that means personal experience – it’s all but impossible to use research to devise good learning experiences for actual learners. It’s like the old caricature of book larnin’ that has someone teaching themselves to swim by reading a book, without ever setting foot in the water. It’s self-evidently ridiculous. 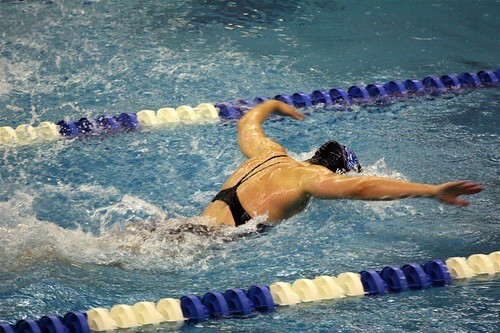 Cutting-edge research in to swimming is helping to create swimming costumes that dramatically improve swimmers’ speed. Would-be swimming coaches who stay abreast of that research might think it would be a good idea to get their hapless learners to wear those for their half-hour learning sessions … failing utterly to appreciate that the gains only come to elite swimmers, and that it can easily take up to half an hour to struggle in to the high-tech suits. This is very similar to Martin Weller’s Pathetic Sharks argument (see p21/22): if we don’t dive in to these technologies, we run the risk of being like Viz magazine’s Pathetic Sharks, who looked scary, but were too scared to actually go in to the water. The deeper issue is identical: Most teachers in higher education are not getting practical experience of digital technologies. It’s just not part of their daily practice. They’re not immersed in it; many have barely dipped their toes in. Even if we could get the very best ed tech research to their fingertips (hard enough), they’re never going to make great use of new technologies in their teaching without that practical experience. Changing the everyday practice of educators is going to be hard. But we have to do it. Higher Education is in the early stages of a transformation that’ll be at least as profound as the upheavals that digital technologies are bringing to the music and newspaper industries. There’s a huge opportunity – and a huge challenge! – for us at the OU and in other universities to lead innovation here. If we don’t, we’re in real trouble. But if we can ride the wave instead of letting it crash over us, it’s going to be extremely exciting times for teachers and learners. And to do that, we – as a community – have to be practitioners in the space we’re trying to innovate in. Update: danah boyd is riffing on the same silly Twitter study, effectively as ever. Author dougclowPosted on 17 August 2009 25 March 2013 Categories mine-rantsTags babble, digital technologies, mountain, patheticsharks, research, teaching, twitter3 Comments on Pointless babble or social grooming? I think we should stop talking about “digital natives” and “digital immigrants” altogether. It’s unhelpful and unclear. A better distinction might be between “digital residents” and “digital tourists”. Firstly, there’s important moral issues in appropriating language about indigenous people and human migration. I really don’t think the parallels are helpful or instructive here. Thirdly, it attributes inherent, unchangability to one’s approach and use of technology. One cannot aspire or attempt to become a digital native: one either is or one isn’t. There are plenty of people who come to digital fluency at a later stage in life than infancy. Fourthly, it unhelpfully sets up an insurmountable barrier of incomprehension between teachers (by definition digital immigrants) and learners (by definition digital natives). I do buy, however, that there are important qualitative differences between people who are familiar with digital technologies and can use them with a fluency, facility and creativity that others can’t. So a much better metaphor, I think, is to contrast “digital residents” with “digital tourists” – or perhaps “digital visitors”. Digital residents are familiar and comfortable with digital technologies, use them as part of their everyday lives, and therefore – to a greater or lesser extent – tend to take them for granted. Digital tourists, however, are not familiar with digital technologies, and struggle to make good use of them. Some are enthusiastic, gushing admirers; at the other end of the spectrum, some loathe every moment of their visit and leave quickly, vowing never to return. Often the things the digital tourists find compelling are very different to the things that digital residents do – partly because of the effect of novelty, and partly because of the amount of time spent there. And as a result, they tend to behave very differently in what’s superficially the same context. The potential tension between tourist and resident is likely to be much less contentious and intractable in the digital world. One of the fantastic things about the digital world, as opposed to the physical one, is that in many ways that matter, more people being there tends to make things better. That’s true in some contexts in the physical world, but not all. If you want to settle and build a house, you have to find somewhere to put it: physical land is (often) a very limited resource, and is what economists call an ‘exclusionary good’ – if I own and build a house on a piece of land, you can’t. But digital “land” is (often) not a limited resource in the same way: me having this blog in no way stops you or anyone else setting up a blog. There are, of course, plenty of people who would dearly love to visit the digital world and perhaps settle there, but lack the opportunity. And we shouldn’t forget the people who are perfectly happy with their non-digital lives and just get on with them. For completeness and entertainment value, we could also include digital xenophobes, who’ve never actually spent any time in the digital world, but still bang on about how awful (they assume) things are there – often spouting ill-informed and hostile speculation. There are still problems with this metaphor. It’s still dichotomising (either one thing or the other), when I’m pretty sure it’s much more of a spectrum. But I think it’s a lot more helpful and accurate. Edit: (with more connectivity) Juliette points out in the comments that plenty of people have already proposed digital residents/digital visitors (as a quick search confirms). There are fewer mentions of digital tourists in this context, although I did stumble on this guide to being a digital citizen, not a digital tourist. I don’t think one should necessarily aspire to being a digital citizen – tourism is perfectly legitimate, so long as it’s done sensitively. And the perspicacious and legendary John Naughton (and I’m not just saying that because he’s agreeing with me here!) draws a helpful parallel with his experience as a tourist in Provence.